Speaking of SuperFoods, Quinoa is known as the SuperGrain. I’ve read the many health benefits of quinoa, not to mention at one point I think, I read it is the grain of the gods (after a little research I believe they were referring to the Inca gods, quinoa originated with the Incas) At any rate, I recently had quinoa at a cooking class. I had forgotten the deliciously nutty and light taste of this versatile, fast cooking, and Superhealthy grain. 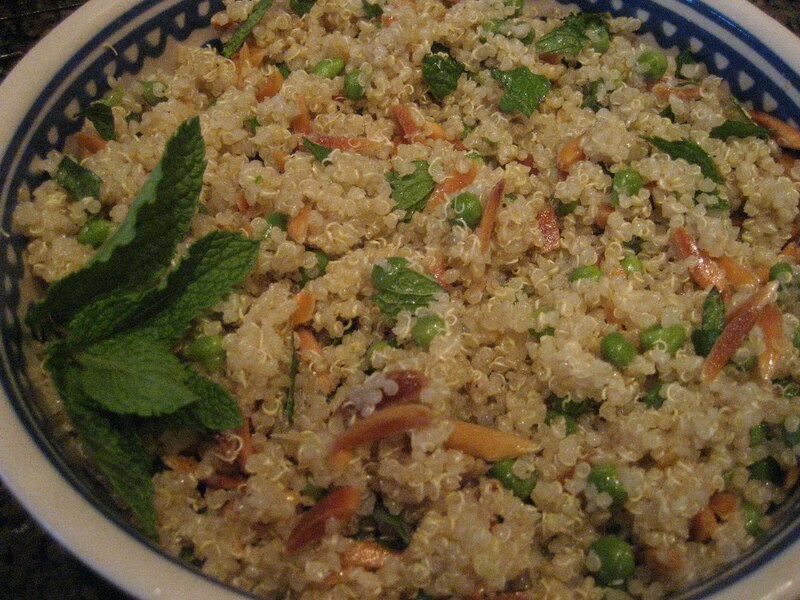 Then I remembered I had marked a quinoa, pea, and mint salad in Martha Stewart’s newest cookbook, “Dinner at Home.” Craving more good for me salads, I made Martha’s quinoa with a minor change, I added toasted almonds. I even thought about adding roasted asparagus and shittake mushrooms, but that would have meant another trip to the grocery store, not today! The result with the almond addition was so yummy, my teenager was eating it by the bowlfuls. This salad is great by the bowlful, as a side dish, but could also serve as a main course with some additions~ roasted asparagus, shittakes and/or chicken. 1. Combine chicken stock and quinoa in a 2 qt. sauce pan. Bring to a boil. 2. Reduce the heat, cover pan and simmer for 10 minutes. 3. Add the peas and cook for 5 minutes or until all liquid is absorbed. 4. Turn off heat and rest for 5 minutes. 5. Stir in the almonds, olive oil and mint leaves. Salt and pepper to taste.